One of my favorite booths at CHA is always the Sizzix one. They have or the larger booths with open space and they share ides, demonstrations, and you can speak with designers. 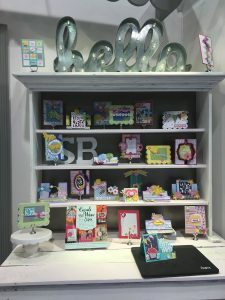 We have so many new Sizzix products coming out this year, I am only going to worry about January and February in this blog post. We will have all these products available for pre-order a few weeks early (prior to release), so you can be among the first to grab 'em! In January, we have the Sizzix stamp sets coming in. There are a total of 15 and most of them are shipping as I write! You can pre-order now and as soon as they arrive we will get them sent your way. 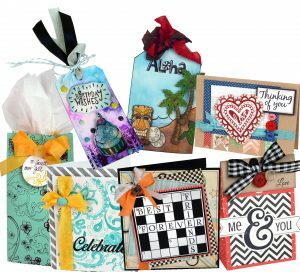 You will love the new Sizzix dies. Pictured to the right are a few ideas of some fun projects you can make using these stamps. My favorite is the Aloha stamp set designed by Jen Long. I love how it all perfectly coordinates together. Combine all the stamps in one project or use them individually. Jen is one of my favorite designers. I really like the projects I have made with her dies (more of those will be released in March!). The other releases for January are from the Where Women Cook line by Jo Packham (pictured to the left). This collection offers some very creative projects and she showed them off with really fun examples. My favorite are the Tiny Party Hats on the bottles and there were coordinating designs on the cupcake wrappers, both from the Cupcake Wrappers die set. So if you love to throw parties, this is the line for you. All of these Jo Packham designs are currently in-stock and shipping so you don't have to wait. 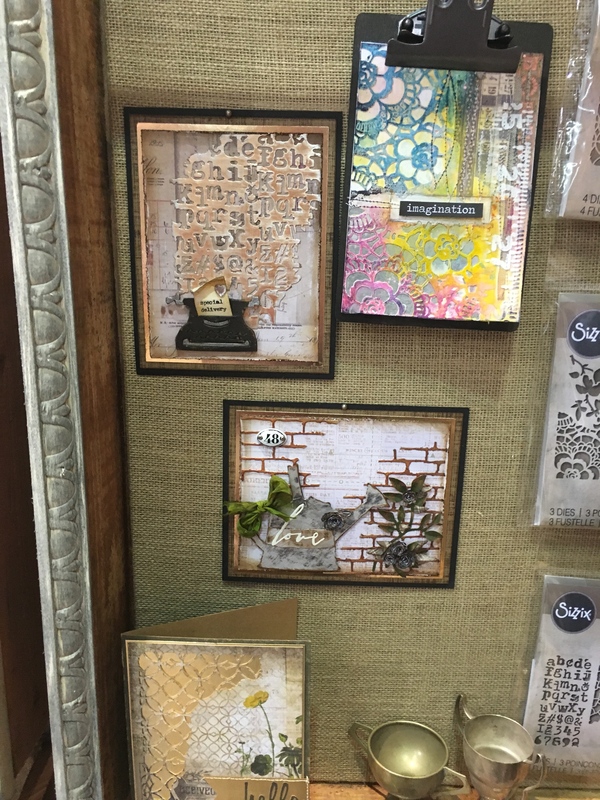 February will bring us exciting products from a collection of our most popular designers: Tim Holtz, Stephanie Barnard, and Sharyn Sowell. We have some unique and interesting products in store for you. Firs t, from Tim Holtz (by far our most popular designer) we have a bunch of new phrase dies coming out: Calendar Words and Daily Words (2 styles of each). Other die sets include Doilies & Lace, Mixed Media #2, and Stitched Ovals, but my absolute favorite from this release is the Detailed Butterflies Thinlits set (pictured to the right). I just think these designs are so beautiful! 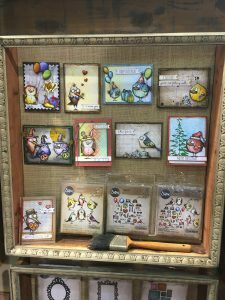 The biggest news from Tim Holtz was definitely his release of the Mini Bird Crazy & Things die set and there is a Stampers Anonymous Mini Bird Crazy & Things stamp set. Both will be arriving very soon and you can pre-order our exclusive Mini Bird Crazy bundle deal! The birds range from 1-7/8" to 2" tall and 1-1/2" to 1-3/4" wide and this time the "Crazy Things" (bird accessories) are included with them. These sets are sure to be a huge hit and we will do our part to keep them in-stock, but there are no guarantees. Pre-order now and we promise to send them out as quickly as we get them in! Check out all of our Tim Holtz Crazy supplies. Next, we have Stephanie Barnard and if you love her Flip-t, Step-up, and 3-D Drop-ins, then you are going to love this new release! 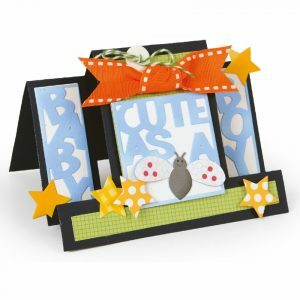 Pictured to the right is the Cute-As-A-Bug Framelits card (it also has the phrase Girl so you can make this adorable card for either gender). Her new 3-D Drop-ins include You are Awesome, Thank You, and Thinking of You (all three are Thinlits). She also has Flower Basket, a Scallop Circle Stand-Ups card, and a few other that you will love. These will be available for Pre-Order the first part of February! Lastly, Sharyn Sowell has some great designs to look forward to. I had the opportunity to speak with her twice. 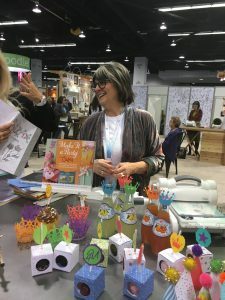 She told me all about how she became a designer for Sizzix, her creative process, and her inspiration. When she is designing, she cuts everything out with a pair of scissors. She simply takes a white piece of paper and starts cutting. The first time I chatted with her, she cut out my profile while I was just standing there. She does amazing work! With her designs, she tries to create dies that can be used in multiple ways. For example, you can slightly tweak the cuts and make big changes to the design. A couple of her new creations that I am especially excited for are the (1) Utensil Wrapper (yes, you can really fit a couple utensils in it). What a fun way to decorate for a party. and a fun basket that will be perfect for Easter. The (2) other design is the Rose Lace Gatefold that you put in an invitation to create a coordinated party theme. I promise you won't want to miss the March and April releases, so check back soon for that post. Jen Long (you are going to LOVE her new stuff), Tim Holtz, who has a new Crazy coming soon, Lori Whitlock, Brenda Walton, and Jill MacKay. Just a quick preview I can't keep to myself, but you can make jewelry with your Big Shot system! I can't wait to share all the fun releases from this product line. It is one of my favorite new releases from anyone this year! Just for fun, this has nothing to do with product, but it was so fun and cool, I wanted to share it with you! 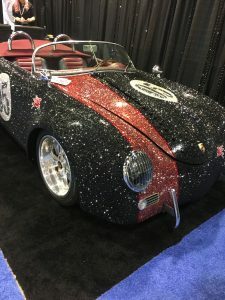 This car was completely covered in craft bling! It was super awesome! I wish I would have kept the flyer from this to tell you how many gems she glued to the car - by hand - one at a time! So crazy. It's almost time for the next big Sizzix release. And when I say big, I mean BIG! 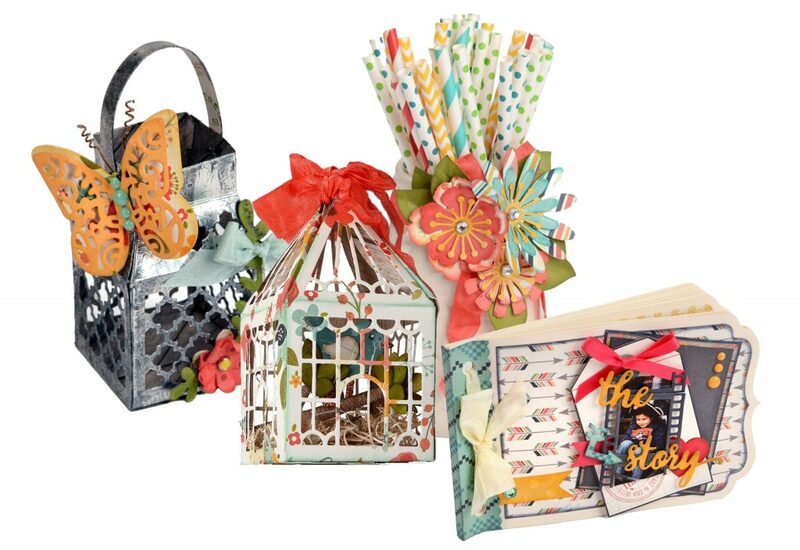 There are over 50 new Sizzix products coming out in the month of April, and I am super excited about it! Some of you may not have know this, but you can cut leather material with these machines. 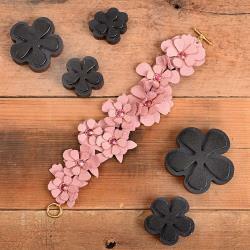 Now Sizzix is bringing you a line of leather jewelry-making supplies. If you already have the Big Shot, all you need is the Movers & Shapers Shuttle (or some of the dies work with the Base Tray). If don't already own a die-cutting/embossing machine, then I would suggest you get the Big Shot Jewelry Studio edition, which is compatible with all Sizzix dies and embossing folders, not just the jewelry collection. So for starters we have 10 new choices in leather material. 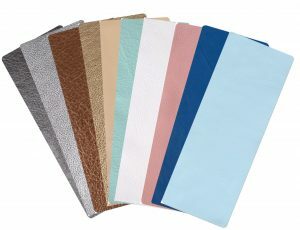 You have your choice of cow hide and lambskin, and there are 10 unique colors - Metallic Silver cowhide, Denim Lambskin, and even Pink cowhide! All these different leather strips measure 3" x 9". Combine these fun leathers together in layers for amazingly creative jewelry designs, just like in the picture you see below. 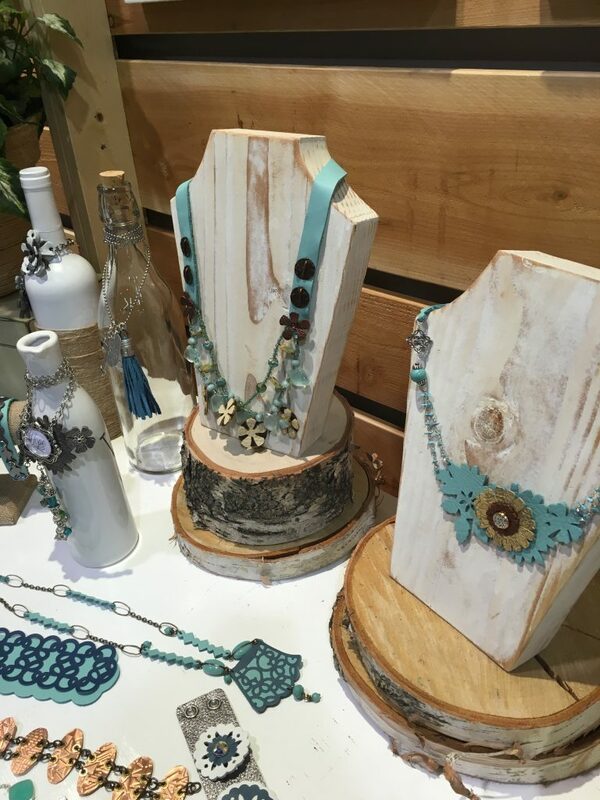 Jill MacKay is the designer behind this great new line of jewelry-making dies, and to start you off she has created a few fun bracelets in a variety of widths and patterns. My favorite is the Open Work Bracelet. I love the width and layered design on this one. She also has a few designs for necklaces - you can see see a few of them in the image above. Beyond that, she also has stack pieces so you can cut these fun designs and stack them to create multi-layered projects. My absolute favorite is the Carnation Stack because I can't wait to make that pink flower bracelet! Doesn't it look stunning? I will let you know how mine turns out. I haven't made jewelry before, mostly because I felt intimidated by them, but Sizzix is making it look so easy. I guess we will see how that goes for me! Finally, from Jill MacKay we have Findings, which are little metal pieces that you can use to enhance your jewelry with functionality and elegance. You can order the entire line of new Sizzix Jewelry by Jill MacKay right here! Speaking of accessories! Now you can add a fun accessory to you Big Shot! 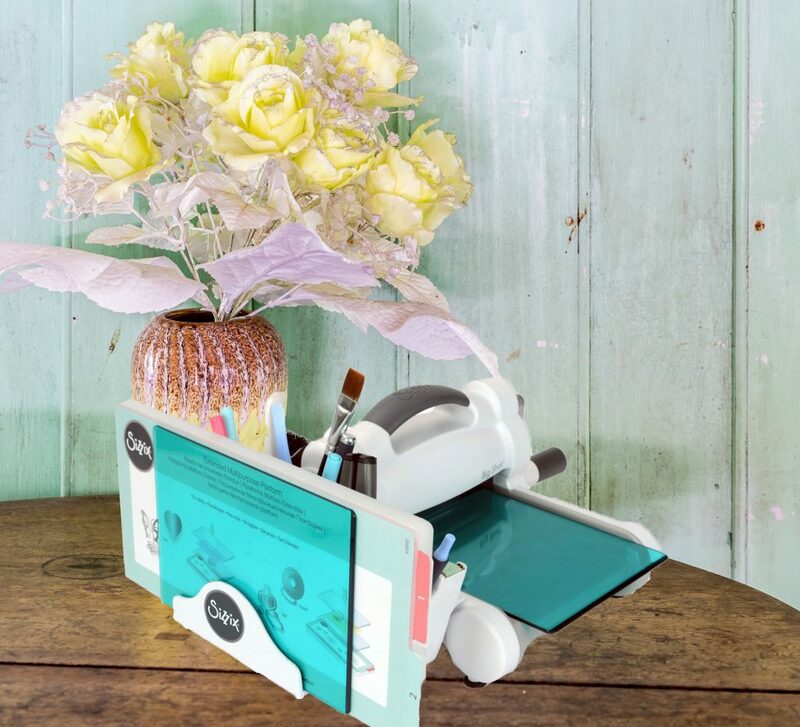 Sizzix has released a Tool Caddy, which attaches to the side of your Big Shot machine, allowing you to store you accessories conveniently (pens, tape, and of course your color cutting pads, etc.). This new accessory comes in Black tool caddy or White tool caddy , so you can choose your preferred color. April is also the second release month for Tim Holtz! To the right is an image of some of the projects he created with his new dies. Finally, we have some other fun dies from Tim, like the Gearhead Thinlits and the Dapper Bigz die! Oh, the fun you will have creating with these great new dies and folders! There have also been fun additions to the Tim Holtz Village collection. Last but definitely not least we have Lori Whitlock! She has such fun projects coming out in April. 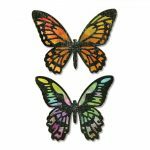 Starting with the Butterfly Lantern and For the Birds die sets - both are great for home decor, party decorations, or even treat boxes. The Essential Mini Albums die set will allow you to easily create fun Mini albums for any occasion! Lori has many other new die sets that are coming out, so be sure to check out her new line! You're going to love them! Well that's it for the April 2016 Sizzix release! Right now we have everything available for pre-order, so if you order now you will be sure to be among the first to receive this great new line of products! Remember to save on all your favorite dies at CraftDirect.